Chris Brown continues to face legal heat. After performing at a nightclub over the weekend, a woman claims that Breezy assaulted her and left her injured. TMZ reports that 24-year-old Deanna Gines is accusing the singer of shoving her to the floor in the VIP section of the Heat Ultra Lounge in Anaheim, Calif. Gines tells TMZ that she has filed a police report, which cops would not disclose details of. 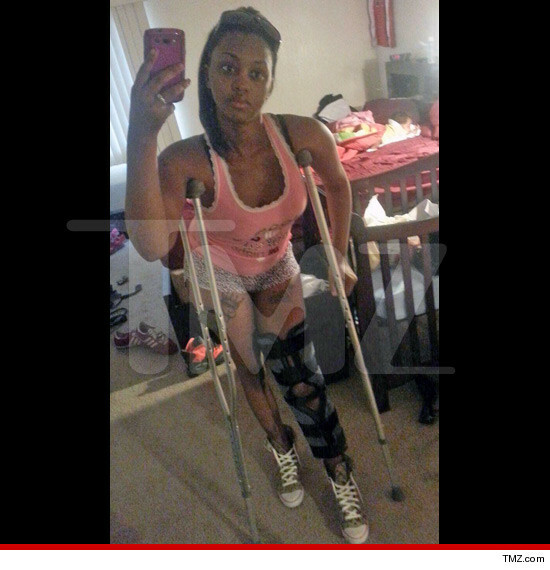 Gines alleges that she suffered torn ligaments in her knee after the throwdown and has a photo of herself wearing a cast to apparently prove it. Cops are said to be investigating. Breezy's rep, Nicole Perna, on the other hand, has no idea about the incident. She told TMZ, "I'm unaware of the incident, as is Chris' lawyer and his entire team...None of this makes sense."